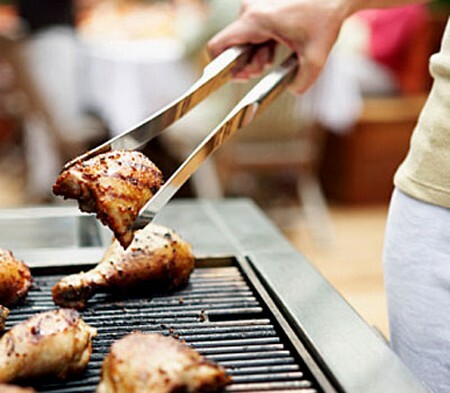 Here arc tips to make your barbecue healthy as well as hearty. Marinate meats overnight for increased tenderness. Clean the grill with a stiff wire brush after each use. Black residue on the grill will make the food taste bitter and will carry over the flavor of the last meal. Don’t put the food on the grill before the flame dies down. If the flame is too hot, the food will be charred, not cooked. When coals turn white, you know they are ready for cooking. Turn poultry or meat with tongs. Make sure they have long safety handles. Piercing meat or poultry with a fork lets some of the juices run out, which decreases the flavor. Flip the hamburgers and serve them with a spatula to help them keep their shape. Wrap fish in foil, or place it in the special metal holders available so it doesn’t fall apart when you turn it or remove it from the grill. Consider buying a meat thermometer so you know when the large pieces of meat are barbecued to the correct temperature. Eat first, then play. Bacteria grow more quickly the longer food sits in the heat. Avoid foods that pose high risks for food poisoning, such as salads with eggs in them or foods made with dairy products. Make sure meat, poultry, and fish are not handled by more than one person, as this increases the risk of spreading bacteria to the food. Add mayonnaise or salad dressing to cold salads when the food is prepared, not just before eating. Contrary to popular belief, mayonnaise actually slows microbe growth in food. If you keep your food in a cooler, make sure each item is chilled by putting ice directly on top of it. Try to minimize the number of times you open the cooler, because each opening lets cold air out. Keep your cooler in a shaded area. Don’t place cooked food back onto the same plate that held raw meat, fish, or poultry. The cooked product could become contaminated with bacteria from the raw food that was previously on the plate. Don’t taste a meat product to check for doneness. Eating even a little bit of undercooked meat could cause prob­lems if the harmful bacteria in it are still alive.